Hillary Clinton is the teachers’ candidate. What changed? How Hillary Clinton is changing the Democratic Party’s relationship with the school-reform movement. 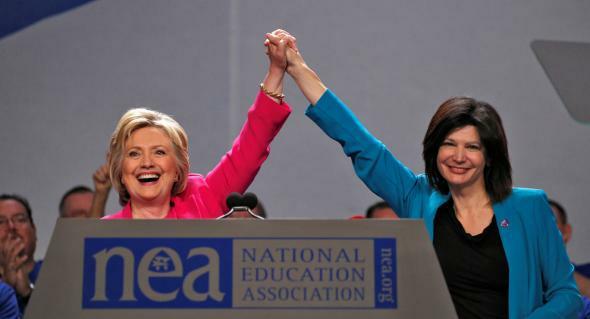 Hillary Clinton clasps hands with National Education Association president Lily Eskelsen Garcia in Washington, D.C., on Tuesday. At 11 a.m. on Tuesday, Hillary Clinton had a huge smile on her face. It wasn’t (only) because FBI Director James Comey had announced he would not recommend criminal charges against her. At the same moment that Comey was opening his press conference, Clinton was being received rapturously by a key Democratic Party interest group: the National Education Association, America’s largest teachers’ union with 3 million members. This speech, the first big moment for K-12 education in this general election, signals a potentially meaningful shift in Democratic Party education politics. The Obama era has been, often, a painful one for teachers-union activists. Obama launched his presidential campaign in 2007 as an ally of Democrats for Education Reform, a group of philanthropists (most with ties to the financial sector) who support weakening teachers’ tenure protections, evaluating teachers according to their students’ test scores, and increasing the number of public charter schools. As president, Obama followed through on his promises to union critics. He created a $4 billion program, Race to the Top, that tied federal education dollars to policies like evaluating teachers according to student test scores and weakening tenure protections, so underperforming teachers could more easily be fired. Two years later, in a speech to the Hispanic Chamber of Commerce, Obama referenced teacher tenure more harshly, saying, “I reject a system that rewards failure and protects a person from its consequences.” If we could fire bad teachers and replace them with better ones, the thinking went, we could narrow the academic fissures between rich and poor children. Obama wasn’t wrong about the excesses of teacher tenure. But in a system in which administrators find it difficult to recruit and retain proven educators to work in racially segregated, high-poverty schools, the challenge of firing teachers has never been the central one in overcoming the achievement gaps Obama hoped to close. He and his allies hugely oversimplified the relevant social science, which hardly points to teachers alone as being responsible for low test scores. Research demonstrates five major, measurable influences on student achievement: Every study shows that, by far, the biggest factor is the educational background and socioeconomic status of parents. In-school factors account for less than half of the variation in how students perform, but at least four are important: peers (a poor child will perform worse if most of his or her classmates are also living in poverty); school funding (districts with more money per pupil provide more resources that kids need, from social workers and guidance counselors to foreign language and art classes); gaps in teacher quality, which research suggests account for between 7 and 15 percent of the achievement gap between poor and middle-class children; and principals, the key figure whose leadership can replicate good teaching across classroom walls. Accountability reformers are increasingly acknowledging these findings, and over the past two years, the Obama administration has adopted a more nuanced view of school reform. Former Secretary of Education Arne Duncan issued a mea culpa of sorts on the overuse of standardized testing, and his successor John King has drawn attention to racial segregation and overly harsh school discipline. Bringing up homelessness, hunger, day care, and pre-K when talking about K-12 education is not an excuse for poor teaching, but rather an acknowledgement of the evidence. Home and family are a child’s foundational educational setting. Anti-poverty and early childhood policies stand to increase test scores as much or more than teacher reforms have. I wrote a book on our historical tendency to blame teachers for society’s ills. So the nuance in Clinton’s speech strikes me as measured and wise. Still, there are priorities of Obama’s I’d like to see her embrace. Teacher accountability isn’t a bad thing; any functional system has mechanisms in place to remove low performers and, even more importantly, help them improve. The Obama administration has begun to provide federal funding for high-quality teacher residency programs, which give trainee educators a full year in a master teacher’s classroom to hone their skills, a standard part of teacher preparation in many other developed countries. I also hope a Clinton administration would add real teeth to Secretary of Education John King’s new rhetorical focus on school segregation and discipline, providing significant federal funding to states and districts that attempt to solve these problems. It’s safe to say it is a new day for the Democratic Party on education policy. But here’s hoping that Clinton’s turn toward the unions doesn’t mean she lets go of some of the Obama administration’s more promising recent ideas.